Many doubted the WNBA would be around that long when the women’s professional basketball league began play in 1997. But the league’s early stars gave it credibility, and this year, the WNBA plays its 20th season. “The WNBA was aided in being established by the Olympics because of Lisa Leslie and Sheryl Swoopes,” said Ann Meyers Drysdale, a Basketball Hall of Famer and Mercury vice president. Swoopes and Leslie were two of the key players on the 1996 U.S. Olympic gold medal women’s basketball team, and both went on to play in the WNBA. Meyers Drysdale was the first overall pick by one of the WNBA’s predecessors, the Women’s Professional Basketball League, in 1978. That league folded in 1981, unable to overcome league debt and popularity hurdles. Unlike the WBL, the WNBA has stuck around, allowing today’s players to grow up knowing playing women’s professional basketball in the United States was a possibility. Griner credits players like the Basketball Hall of Famers Leslie and Swoopes for keeping the league alive. “From the hard work, the pioneers that played before us and the ones playing now, they’ve done a tremendous job showing everyone what we can do and are equal to the men,” Griner said. The league has faced its share of issues, including teams folding and relocating. The Detroit Shock moved to Tulsa in 2010 and relocated a second time to Texas as the Dallas Wings for this season. The Orlando Miracle became the Connecticut Sun, playing at an arena at the Mohegan Sun casino. In 2003, the Utah Starzz relocated to San Antonio where they are now known as the Stars. The Miami Sol and Portland Fire folded in 2002, the Cleveland Rockers in 2003, Charlotte Sting in 2006, Houston Comets in 2008 and Sacramento Monarchs in 2009. Only three of the original eight WNBA teams remain active in the cities where they began play in 1997 – the Mercury, the New York Liberty and Los Angeles Sparks. “The growing pains have been rule changes, television exposure, representing FIBA World Championships, there’s just more talent on teams now,” Drysdale said. Diana Taurasi, entering her 12th year for the Phoenix Mercury, said the league has a promising yet challenging future. “It’s pretty amazing that the WNBA has been here for 20 years,” Taurasi said. “That’s a long time. We have some pretty incredible fans that really make the league so special. The only way for the league to get better is for the players to get better, the coaching getting better, the refereeing and putting a better game on the court. “We need more and better basketball players, and that’s fine. That’s a challenge for us as a basketball community,” Taurasi said. Another key challenge, according to Taurasi, is media coverage and exposure. The WNBA’s national television schedule pales in comparison to the NBA. The 2016 WNBA season features a total of 56 nationally-televised games spread across ESPN, ESPN2 and NBA TV, but only 14 of those will be on the much larger ESPN family of networks. In comparison, ESPN and ABC combined to air 90 NBA games this season to go along with 53 on TNT. “I think that’s one challenge the WNBA has had the most is getting stories out there. People who’ve made basketball their life,” Taurasi said. “I don’t think we get the same story line and rhetoric as some other sports, mainly men’s, and that’s something that has hung over our head. “People don’t know the individual stories of a lot of these players and coaches. If they did, they’d feel different about them on the court,” she said. Many WNBA players would like to see sold-out arenas, more exposure and higher salaries. Several, like Taurasi, go overseas to play for other leagues to make most of their income. At the request of her Russian league team, Taurasi sat out the 2015 WNBA season after accepting a deal from the team for $1.4 million, Drysdale said. 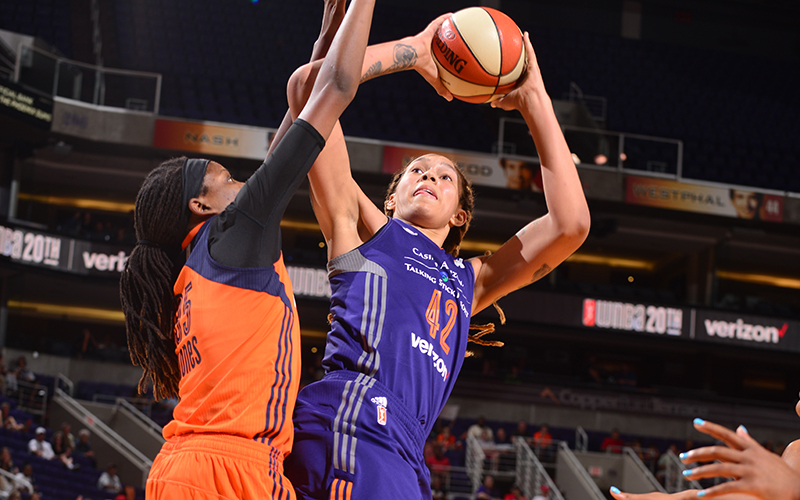 Griner sees hope for league growth via social media. “Social media is big when it comes to marketing yourself, marketing your brand and teams,” Griner said. “Even my generation, we’re all on our phones. Everyone including myself is looking something up. I do it all day long. “Because of social media, it definitely helps out the younger generation connect and strive for being athletic professionals,” Griner said. Although the WNBA has faced criticism over its 20 seasons, Taurasi said the league has plenty of reasons to celebrate how far it has come.